Check out our latest Rural Futures podcast episode with Robin Jourdan. Robin is a great friend and fellow futurist who has recently been named a Fellow by Association of Professional Futurists. Robin talks about Generation Alpha…the children of Millennials (and some of us late bloomers in Gen X)…and about being a futurist and leader in a world that is changing rapidly. Can you imagine airspace as an income source? What is the future of autonomous (and flying) vehicles? How can we incorporate sustainability into all we do? 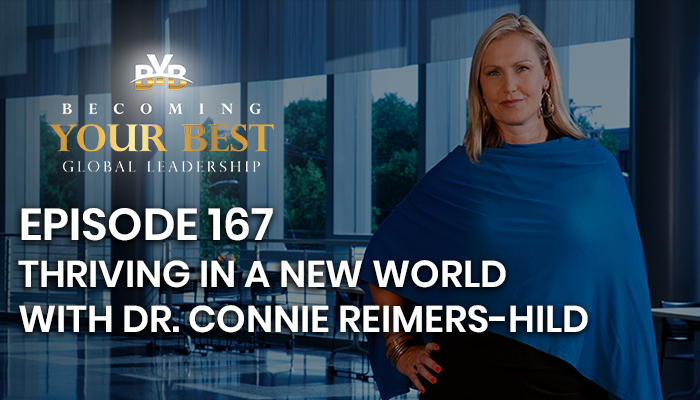 Robin spent 25 years in the automotive industry and has some amazing insights on this topic! Enjoy the episode!! PS: There is now a 2 passenger drone that may be available to consumers sooner than you think! How do you think technology will evolve with people (or vice versa), especially women, in this rapid era of change? This is the question Steven Shallenberger and I explore in this podcast episode. Steve is the founder of Becoming Your Best Global Leadership, LLC and host of the Becoming Your Best Podcast. Join us for a conversation focused on leadership, globalization and the future of humanity. Please join this important global conversation and reply with your thoughts, ideas and experiences in the comment section below. I am thrilled to be leading a strategic foresight session in partnership with the Western Healthcare Alliance as part of their Annual Summit. 3. Collectively and Openly Innovate to Co-Create the Future by Asking and Answering: What can our Health Organizations do Together? Healthcare is undergoing a massive disruption like so many other industries. Many women are leading this change as part of the health and healthcare industry. They are also leading it as consumers. I am curious…how do you see the future of health and healthcare evolving? Looking forward to hearing your thoughts, ideas and insights! Purpose and vision are two key elements when creating and living your desired future. Individuals and organizations investing in transformation must make the time explore and clearly define their purpose and their vision. It is an important first step in my futuring and coaching process and is especially important for women (and men) who find themselves in new, and many times unexpected, stages and ages of life. One of my top Strengths is Learner, and I am always interested in learning more about ways to help clients dive into their inner and outer worlds worlds. 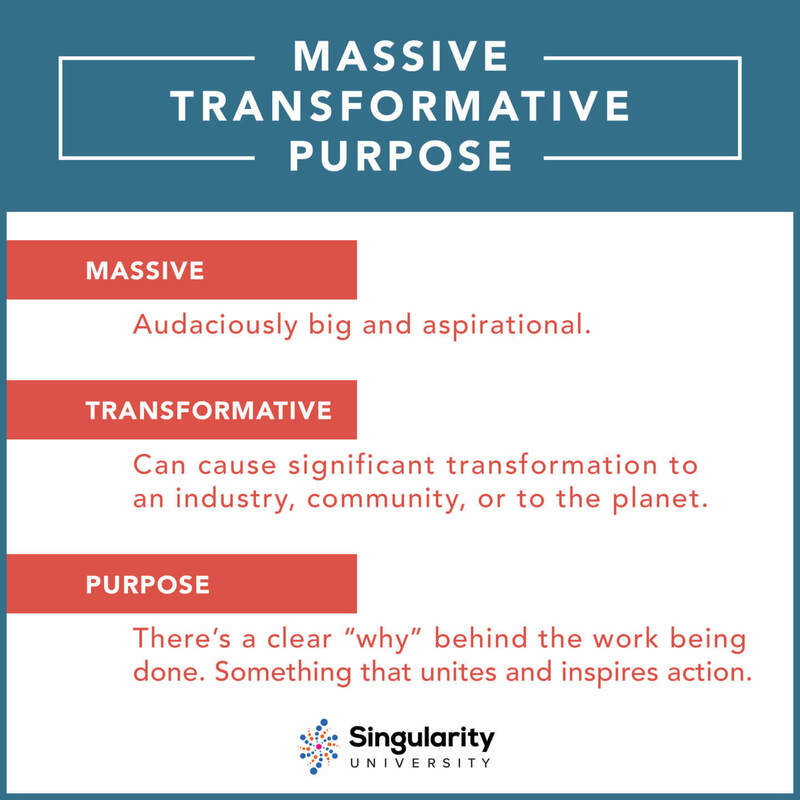 I am in the last of three online strategic foresight courses offered by Singularity University, and I am really excited about their lesson on developing what they call the Massive Transformative Purpose (MTP). I am sitting at my computer working on my new and improved MTP right now (aka my homework). The great thing about this assignment is that I can use and apply the information in my own life. It is the end of 2018, and I have fresh, global perspectives that are making me think differently about my business. New opportunities are popping up everyone, and I need to decide where to focus my time and talents. I am looking forward to walking through this process – not just for my homework – but to improve my work and life as well! Take a look at the process below and share your MTP’s with me. I would love to hear from all of you!! Go Wild and Share Your MTP! Eradicating diseases, mastering flight, near-instant global communication, going to the moon—humans have developed a taste for making the impossible possible.Though we still face a daunting list of global challenges, we’ve learned that science and technology can uncover big solutions. But mind-blowing breakthroughs don’t just happen. They take teams of bright and dedicated people chipping away at the problem day and night. They take a huge amount of motivation, toil, and at least a few failures.To solve our biggest problems, we need people to undertake big tasks. But what drives someone to take on such a difficult, uncertain process and stick with it?There’s a secret to motivating individuals and teams to do great things: It’s purpose.Social movements, rapidly growing organizations, and remarkable breakthroughs in science and technology have something in common—they’re often byproducts of a deeply unifying purpose. There’s a name for this breed of motivation.It’s called massive transformative purpose or MTP.Setting out to solve big problems brings purpose and meaning to work—it gives us a compelling reason to get out of bed in the morning and face another day.Peter Diamandis likes to say, “Find something you would die for, and live for it.”The more we organize around massive transformative purpose, the harder we’ll work, the more dedicated we’ll be, the faster we can solve big problems—and maybe most importantly, the more fulfilled we’ll feel about the work we do.This article will explore ideas we’ve learned from some of our favorite big thinkers on what makes an MTP and how to find and implement yours. In 2014, Salim Ismail published Exponential Organizations, co-authored by Mike Malone and Yuri van Geest. In the book, the team analyzed the 100 fastest growing organizations and synthesized their key traits. They discovered every single company on the list had a massive transformative purpose. In the simplest sense, an MTP is a “highly aspirational tagline” for an individual or group, like a company, organization, community, or social movement. It’s a huge and audacious purpose statement. SpaceX’s MTP does this so well that they’ve also activated a cultural shift outside of the company’s walls, which is a secondary effect of having a strong MTP. Other examples Ismail, Malone, and van Geest note in their book include the massive lines that form when Apple releases a new iPhone or the huge waitlist each year to get a seat at TED’s annual conference. MTPs can inspire whole communities and evangelists to form around them. Having an MTP can trigger incredible outcomes, which is why high-growth organizations all tend to have them. The aspirational quality of an MTP pushes teams to prioritize big thinking, rapid growth strategies, and organizational agility—and these behaviors all have substantial payoffs in the long term. As an MTP harnesses passion within an organization, it also galvanizes a community to form outside the company that shares the purpose. This sparks an incredible secondary impact by helping organizations attract and retain top qualified talent who want to find mission-driven work and remain motivated by the cause. Additionally, when people are aligned on purpose, it creates a positive feedback loop by channeling intrinsic motivation towards that shared purpose. Finally, like a north star, an MTP keeps all efforts focused and aligned, which helps organizations grow cohesively. As the organization evolves and scales, the MTP becomes a stabilizer for employees as they transition into new territory. ASSESSMENT QUESTIONS 1. If at the end of your life you had made a significant dent in this area, how proud would you feel? 2. Given the resources you have today, what level of impact could you make in the next three years if you solved this problem? 3. Given the resources you expect to have in 10 years, what level of impact could you make in a 3-year period? 4. How well do I understand the problem? 5. How emotionally charged (excited or riled up) am I about this? 6. Will this problem get solved with or without you involved? Realizing an MTP requires a different type of thinking. It requires a mindset and work environment that leans into complex problems and dares to think big—really big. SpaceX isn’t where they are today because they focused on making 10% improvements to existing aerospace technology. And Google’s self-driving car isn’t the byproduct of a goal to make a 10% improvement to driving. 10% thinking leads to incremental progress, which doesn’t lead to making the impossible possible—like sending people to the moon. Through history, however, we’ve learned that radically big thinking can lead to these types of breakthroughs. You have the recipe for creating a massive transformative purpose to push you and your organization to the next level of performance and impact. Now, it’s time to get to work. My whirlwind 2018 global tour is at an end. Japan was awesome, and I had the time of my life presenting with a panel of incredible women at the 2018 Global Women’s Forum in Paris, France. However, the best part of it all…an Instagram post from one of the members of the Rural Futures team – thanks Katelyn!! You are incredible. Thanks for going a little wild and helping us all be our best Ki! It was an honor to be interviewed by Melinda Wittstock! Melinda is a successful entrepreneur and leader dedicated to helping women achieve their best in business and in life. Her podcast, Wings of Inspired Business, has become my go to podcast for not only inspiration, but also practical tips I can apply in leadership and in life. And, this woman is connected! She has interviewed women such as Christy Whitman. Christy is a transformation leader and New York Times bestselling author. And scientist entrepreneurs like Gitte Pedersen who is changing the future of healthcare by revolutionizing cancer treatments. And, make sure to download your free gift! A digital copy of Blue the Bee Learns to Be Happy. The interactive adult (and family) coloring and activity book designed to add more happiness and health to your life (and future)! One of my favorite things to do is work with leaders who are eager to shape the future. I especially enjoy working with leaders in the $3 trillion healthcare space. Why? Their world is being disrupted at an increasingly rapid pace, and many leaders in this important industry are doing what they can to innovate and shape the future. I also appreciate the fact that women comprise a large portion (approximately 75%!) of the healthcare industry. When I help hospitals and other other healthcare organizations reinvent their futures, I am helping female leaders, their families and their communities. Thanks Western Healthcare Alliance and all involved for taking on this important conversation about leading innovation to help build a better future for all the people and communities your serve. I just read a brilliant article by Ada Calhoun, The New Midlife Crisis: Why (and How) It’s hitting Gen X Women. Gen X, the generation often ignored by researchers, employers or even in basic conversations and presentations about generational differences, had a very different upbringing when compared to their parents or their children. We are an ambitious generation that created successful companies but also struggled in careers while figuring out how to “balance” work, family and gender dynamics. Many remained unmarried and childless by choice. Others married and had children much later in life than previous generations-yes, that’s me! Midlife has changed, and there is little understanding of midlife challenges and opportunities in the modern era. I agree with Calhoun about many of the challenges (underemployment, regret about life decisions, etc). However, I also think our bold and courageous generation continues to shape the world in many positive ways. Gen X continues to shape organizations, businesses and communities with their independence, work ethic and drive to have a personal life. The pressure many Gen Xers put on themselves can be a blessing but also a curse. One key to a more positive midlife is letting go of regret and so much self-censoring while making life more of an adventure. Generally speaking, many of us were bold and independent in our youth. We are the generation of big hair, shaved sides, multiple piercings, video games, loud music and mohawks. If there is any generation who can find ways to enjoy it all more-it is ours. Gen X has done more for this country than most people realize without receiving or even needing the credit for their accomplishments. We have been leading under the radar for most of our lives, and it is time to raise our hands and voices to audaciously shape the future, especially for women (more on this in a later post). What does this more modern midlife look like to you? How are you dealing with the challenges, pressures and stress? What great adventures are you having in your midlife? What new opportunities are you pursing? Let us know by leaving a comment. We would enjoy hearing from you!